To the left is a photograph of my paternal grandmother, Belle (Sissie) Feinstein, and her brother Seymour (Babe). I don't have a year for the photograph, but my grandmother was born in 1914, and her brother in 1917. I'm not sure where they are, but I notice if they aren't in their 'Sunday best', they're pretty close to it. Not the attire one would normally expect one to wear to go pony riding. Possibly they were at someone's birthday party, or some other celebration that included pony rides for the kids. 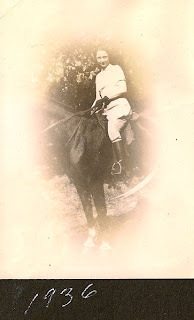 The theme for the 78th Carnival of Genealogy is Pony Pictures, and this picture is the first one that came to my mind. However, I knew I could find a couple more if I broadened the search to taller cousins of the pony, such as the horse. On the right is my maternal grandmother, Myrtle Van Every. The caption places the year at 1936, which is the year she married my grandfather on December 31, so there is a good chance he took the photo. One look at her boots, and you can tell she was there to ride. She was no stranger to horseback riding at that point, and had long been a fan. 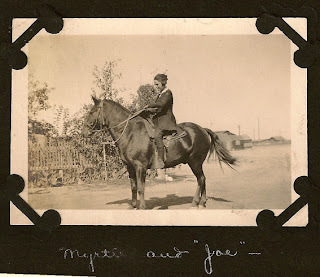 While my paternal grandmother was a city-girl, growing up in urban St. Louis, my maternal grandmother grew up on a Texas farm. There is a story she once broke up with one of her beaus, because he wouldn't buy her a saddle. Here is a photo of her in 1919. 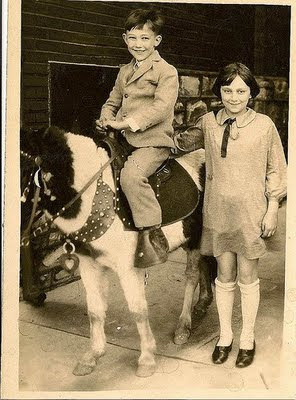 The caption even tells us the name of the horse.